The National Garden Bureau has named 2019 “The Year of the Snapdragon,” celebrating a flower that has long been a favorite for gardeners and florists alike. Typically planted as an annual, snapdragons are hardy, sweet-scented flowers that come in many colors. Their tubular blossoms, shaped like tiny dragon heads, grow directly from a thick central stem, forming a tall, showy display. Each year, the National Garden Bureau selects one annual, one perennial, one bulb crop and one edible for its “Year of the” program. These plants are chosen because they are popular, easy to grow, adaptable, genetically diverse and versatile. For 2019, the bureau chose the dahlia as the bulb crop, pumpkin as the edible, salvia nemorosa as the perennial and snapdragon as the annual. Because snapdragons can tolerate cold temperatures, they are often one of the first flowers to be planted by gardeners in the spring, according to the National Garden Bureau. They’re typically planted as an annual, though they’re winter hardy in USDA Zones 7 to 10. Snapdragons are native to the Mediterranean region and parts of the Middle East and North Africa, according to the National Garden Bureau. They were grown in ancient gardens during the rise of The Roman Empire and rapidly spread throughout Europe, then to the United States, where they thrive in most regions of the country. The flower’s fragrance attracts pollinators including hummingbirds, bumble bees and other large bees. In addition to being a flowerbed staple, the snapdragon is a popular cut flower. Snapdragons also come in a range of heights. While medium snapdragons grow to be 16 to 24 inches tall, dwarf snapdragons are just 6 to 10 inches tall, making them easier to arrange in garden beds, and especially tall snapdragon varieties can grow to be 30 inches tall. 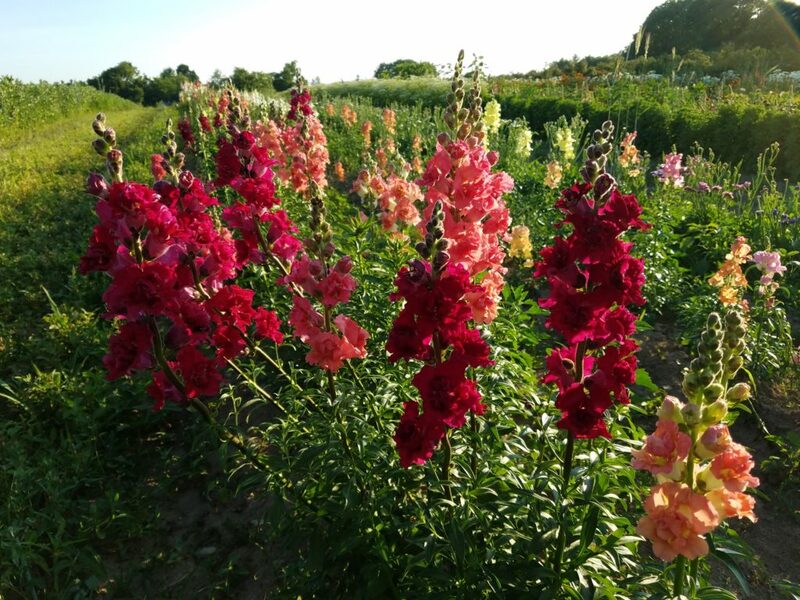 In addition, some snapdragon varieties have slightly different blossom shapes, and they bloom at different times. “There’s an endless amount to learn about snapdragons,” Snell said. Snapdragons are relatively easy plants to care for, Snell said. They perform best in full sun, and the medium and tall varieties usually need to be staked to prevent them from falling over and breaking. In addition, snapdragons should be fertilized like other bedding plants, according to the National Garden Bureau, and they should be watered regularly so their root system becomes well established, which helps them remain upright. To encourage snapdragon plants to grow several stems of flowers instead of just one, Snell pinches off a portion of the plant while it’s still young, leaving about two or three pairs of leaves. Removing dead flowers will encourage the plant to keep producing flowers, and it will also prevent gray mold disease, according to the National Garden Bureau. In addition, cutting snapdragons — say for a bouquet or to place in a vase — often causes the plant to produce more blossoms. “They have a cut and come again quality,” Snell said. Rabbits and deer don’t tend to eat snapdragons, Snell said, and while some insects like eating snapdragons, they usually don’t do too much damage. To learn about the other “Year of the” plants for 2019, visit ngb.org.